Strawberries are an odd crop choice for the Homestead to cultivate, given three of the six of us are allergic to them. However, their value as bartering items, delicious gifts, or as a total indulgence for the three of us not so afflicted, plus the plant’s sheer delight in having their roots in the Homestead soil ensures they make the planting/bed maintenance schedule each year. We’d been watching a cluster of them, scattered around different plants in the garden, slowly changing from green to cream to a blushing pink. Every morning they were just that bit closer to picking until yesterday we could see it would take just one more night. We could barely contain our excitement as we strode down the gravel path this morning. The first stop was production central located under one of the most overworked pieces of equipment on the Homestead, the clothesline. Were they ready? How many? Which plant produced the biggest? Umm..can you remember where they…were? You knew where this was going, didn’t you. Yes, it appears something had beaten us in the berry race. Snails? Slugs? Birds? Actually, none of the above as outraged investigation of the crime scene soon revealed a hedgehog had recently been in the vicinity. We encourage these into our garden as they are great mobile snail and slug disposal units but it seems one of them has developed a taste for one of our prime products. Immediate action was called for! 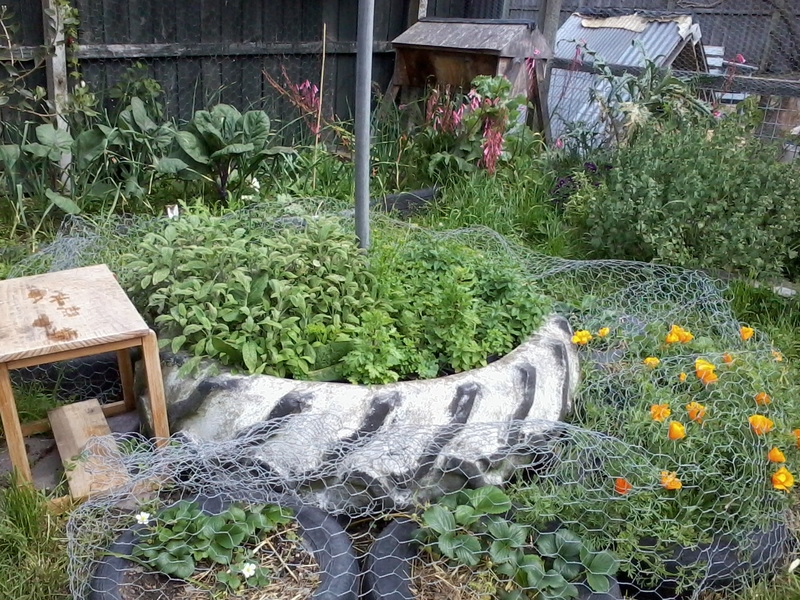 So today was spent wrestling a roll of recycled chicken mesh into a passable strawberry protective shield. Just to be on the safe side, we also trimmed the long grass back from the sides to dissuade any lurking snails and slugs, and fully enclosed the plants to foil any winged fruit burglars. Retrieval of the ripe berries should (and this word is used deliberately) be simply a case of flicking open the nearest ‘pleat’ in the wire. Like everything on the Homestead, this is a ramshackle arrangement, constructed in great haste, from very little, but it should work if everyone is on board. As long as the harvesting Homesteader remembers to re-secure the protective shield, the Strawberry thief should be Foiled Forever. This entry was posted in Garden, Union Homestead and tagged allotment, Berries, berry, birds, garden, gardening, growing, Homestead, Homesteader, homesteading, losing crops, NaBloPoMo, organic, organic garden, organic gardening, organics, pest, pests, slug, slugs, small holding, snail, Snails, strawberries, strawberry. Bookmark the permalink. Music does keep creeping in with you doesn’t it …great pun :). That is frustrating. It’s not fair that other creatures value perfect ripeness as much as we do…I don’t think we have hedgehogs, but we do have rabbits and deer to contend with. And a squirrel, who beats me to the hazelnuts every year. We (actually the 19 yr old) built a cage for our strawberries this year to keep the deer and rabbits out. It involved netting and bulldog clips (yes the kind used for holding papers together), and even a few twist ties. Not my handiwork at all – I’m a chicken wire and baling twine person myself. Your garden is looking so lush and verdant and full, a sight for sore eyes, as we were all commenting today that we’re definitely in winter. After a couple of good blows, and a week of nights below 0 C, everything looks stark and unpretty. Wow! Bulldog clips and twist ties…we’re impressed and also slightly inspired. I think I just like bindertwine so much because it allows me to show off my knot tying skills – all those years in the girl guides have to count for something! What a cheeky hedgehog, hope the strawberry defences hold out against him/her. Me too. I had no idea they actually ate any form of vegetation; I guess you live and learn. As a newbie to your blog: I love the enormous tyre planters! The birds stole my strawbs, until I netted them, and then the slugs mocked me by nibbling each and every one just a little. With regards to getting to your strawberries first: we chalk it up to you win some, you lose some. curses to those mocking slugs! Musical references are like gold dust in a post, they add sparkle.